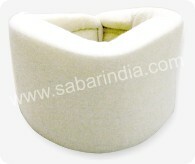 Made up of high density foam and semi hard flexible insert and it is covered with soft cotton stockinet fabrics. 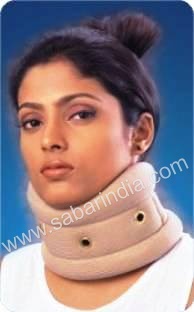 Sabar Cervical Collar is designed to provide correct support to cervical spine and keeps it in natural or anatomic position. 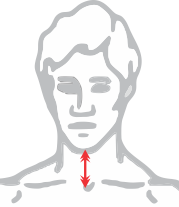 M 10-12 cms 4" - 4-1/2"
L 12 - 14 cms 4-1/2" - 5"
Measure distance from Tip of chin to Sternal Notch (Notch between collar bones where ribcage starts) for appropriate height. Fix from the front under the chin. Center the cutout center part of the collar at the chin area. 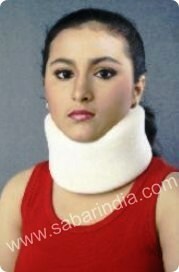 Apply the device gently around to the back of the neck. Looking for symmetry- equal alignment of the collar. 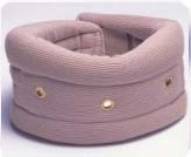 Avoid pressure points and avoid collar rubbing and irritating to ear lobes.